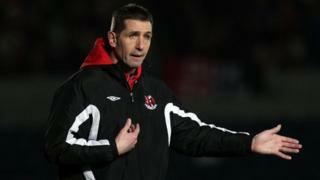 Crusaders boss Stephen Baxter believes only a victory over Premiership leaders Cliftonville on Saturday will keep them in the title race. The Crues go into the Seaview clash 12 points behind the pacesetting Reds although they have a game in hand on their north Belfast rivals. Baxter said the teams are evenly matched despite Cliftonville romping to a 4-0 win over Crusaders in the League Cup final last month.